TSV welcomes Jubilee Sailing Trust Australia as our latest affiliated member. Who is Jubilee Sailing Trust? The Jubilee Sailing Trust (JST), an international UK based charity whose mission is to promote the integration of people of all physical abilities through the challenge and adventure of tall ship sailing, has officially established a presence in Australia. For 35 years the JST has provided life-changing adventures to people of all ages, backgrounds and levels of physical ability, providing them with a sailing experience that gives them the confidence and perspective to help them achieve their wider life goals. JST’s expansion into Australia will give it the chance to develop the reach and impact of its mission, and to offer exciting new programmes to its voyage crews, giving them more choice and opportunity to experience epic adventures. The JST has a strong history with Australia. Their first ship, Lord Nelson, visited Australia and New Zealand in 2013 as part of the Norton Rose Fulbright Sail The World Challenge, during which she took part in the Royal Australian Navy International Fleet Review as well as offering voyages to Fremantle, Adelaide, Sydney, Melbourne, Hobart and New Zealand. The visit was a resounding success and led to the decision by the JST to establish a presence in Australia. To mark the expansion into Australia, Tenacious, the second purpose built tall ship operated by the JST to enable physically disabled crew to sail alongside their able-bodied counterparts as equals, will set sail from Southampton to Australia in November 2015. She will sail via Antigua, navigate the Panama Canal and down through the islands of the South Pacific, arriving in Melbourne in August 2016. A new company, Jubilee Sailing Trust Australia Ltd. (JST Australia) will be based in Melbourne, home to the JST Australia Patron John Calvert-Jones AM, Chairman Harry Cator, Director Glenn Johnston and Director – elect Peter Harris, President of Tall Ships Victoria. Melbourne has a rich maritime history and an exciting and growing Tall Ship community. JST Australia looks forward to helping build awareness of tall ship sailing within the local community, working closely with fellow tall ship operators to open up opportunities for local able and disabled bodied people to experience the thrill and adventure of tall ship sailing. JST Australia has already built strong links with Tall Ships Victoria, the Royal Yacht Club of Victoria and the Alma Doepel restoration project and is keen to engage with other like-minded organisations. “We are excited to be establishing ourselves in Australia and are looking forward to working with the local communities and other tall ship operators to offer sailing experiences to a wide range of people’. 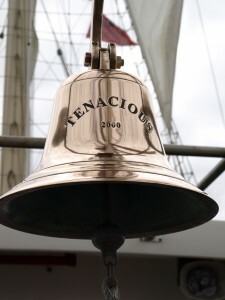 The full programme of voyages and events for Tenacious while she is in Australian waters will be launched in October 2015. Anyone interested in volunteering or supporting the visit, please look at our website (www.jst.org.uk) and Facebook page (https://www.facebook.com/JubileeSailingTrust) for details.